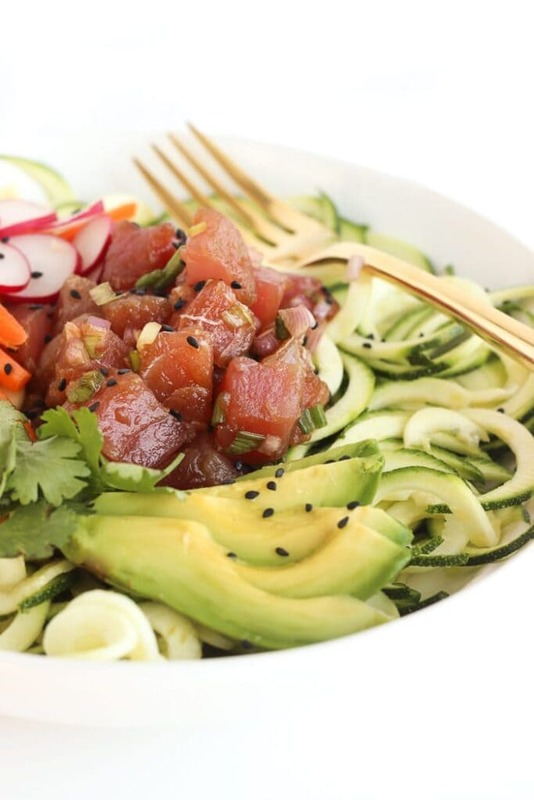 Have you tried poke yet? 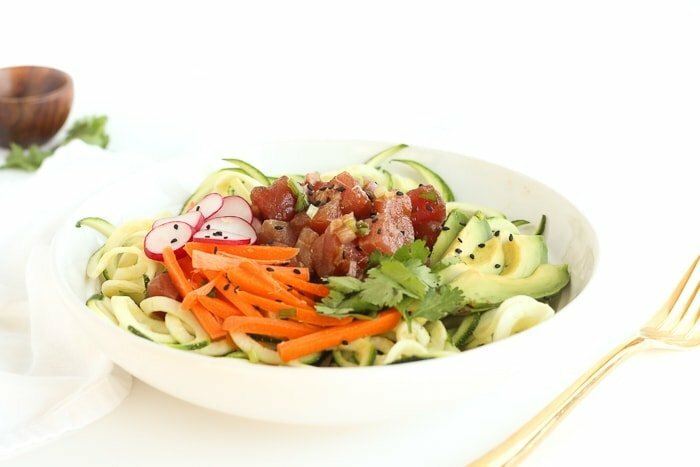 For those of us who don’t have the chance to go to Hawaii on the fly to grab some delicious island cuisine, I’ve got a recipe for poke that you can make at home. And if you do get to go to Hawaii whenever you wish, UM, HI, TAKE ME WITH YOU! 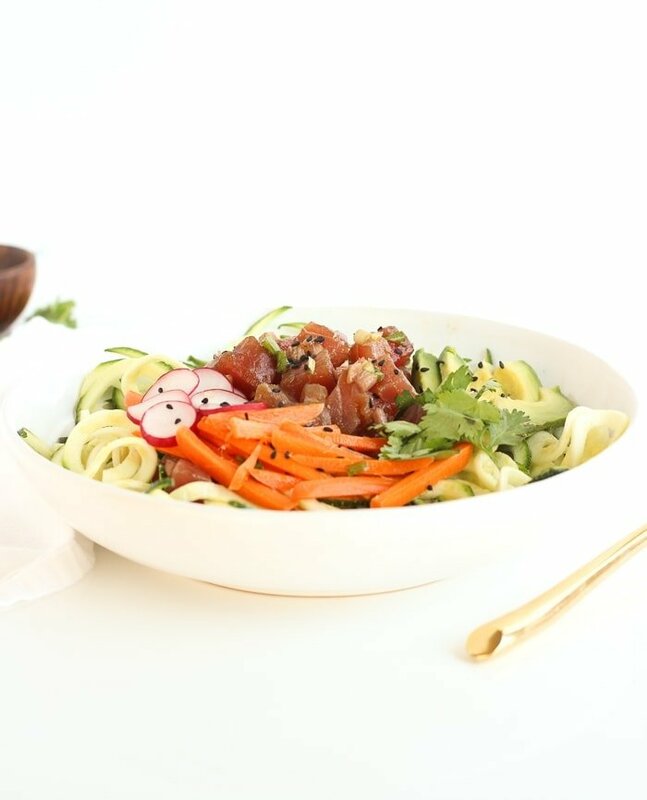 This delicious version of poke uses sushi-grade yellowfin, or ahi, tuna that is mixed with a super simple sauce of soy sauce, sesame oil (I use Chosen Foods spicy sesame oil to make it extra delicious), shallot and green onion. Traditional poke is served over warm rice. 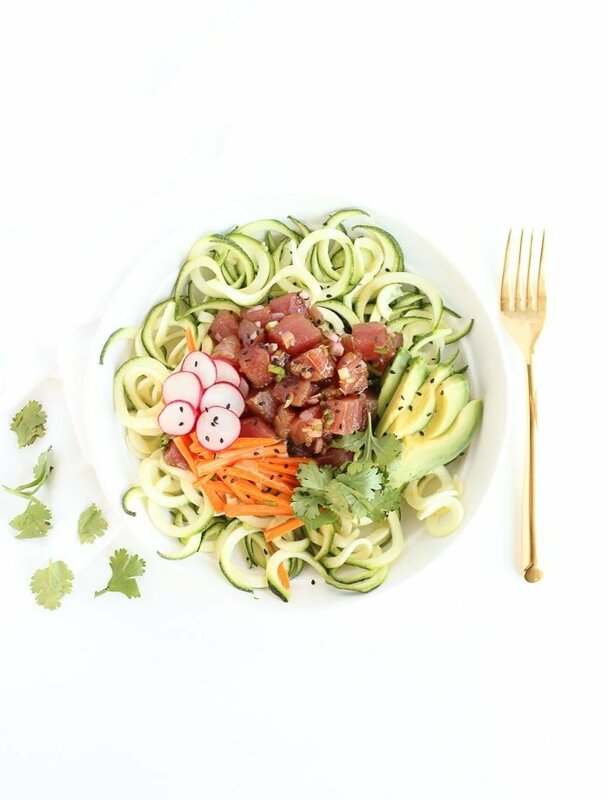 I decided to make this poke a little more fresh and easy (aka no-cook) by serving over fresh zoodles. 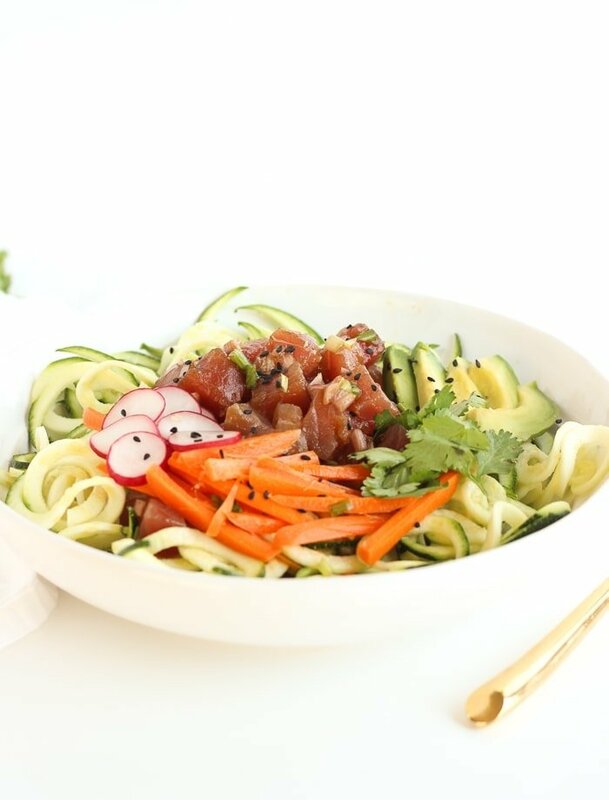 I also decided to jazz it up a little with fun toppings like avocado, quick pickled ginger carrots and cilantro to make a yummy Zucchini Noodle Poke Bowl. Because everything is more fun in bowl form, right? 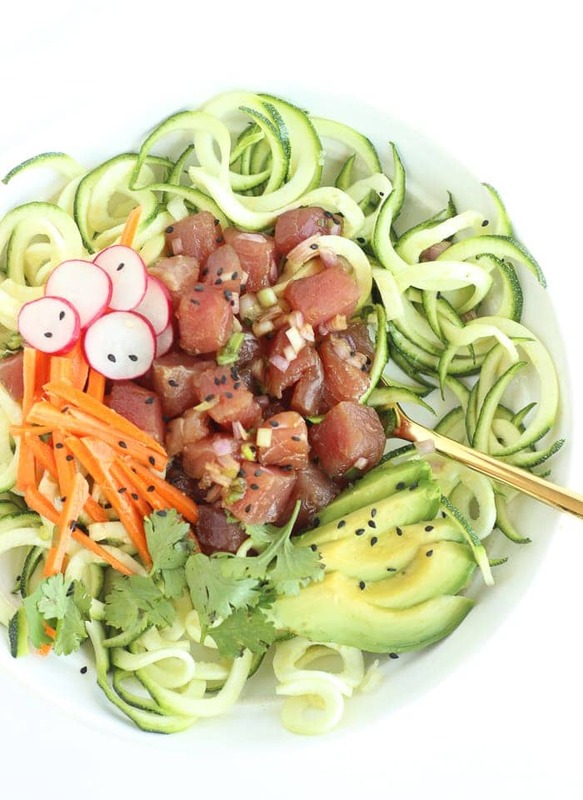 This Zucchini Noodle Poke Bowl is full of protein, fiber and healthy fat thanks to naturally omega-3 rich tuna, avocado, and all the fresh veggies. The recipe can easily be made gluten-free by using tamari in place of soy sauce. If you have any other fun toppings or sauces you want to add, feel free to get creative. Don’t know if your local grocery store sells sushi grade fish? Just ask the butcher. They’ll be able to point you in the right direction. If they don’t sell it, well, you just might have to move. Preferably to Hawaii. Also, can I come visit you? Place carrots in a jar. Wisk together sugar, ginger and vinegar and add to carrots. Shake and refrigerate while you prepare remaining ingredients (or for 1 hour) to quick pickle carrots. Using a sharp knife, cut tuna neatly into 1/2-inch cubes. Place in a non-reactive bowl. Add soy sauce, sesame oil, shallot and green onion and stir to combine. Refrigerate while you prepare other ingredients. Divide zucchini noodles between 2 bowls. 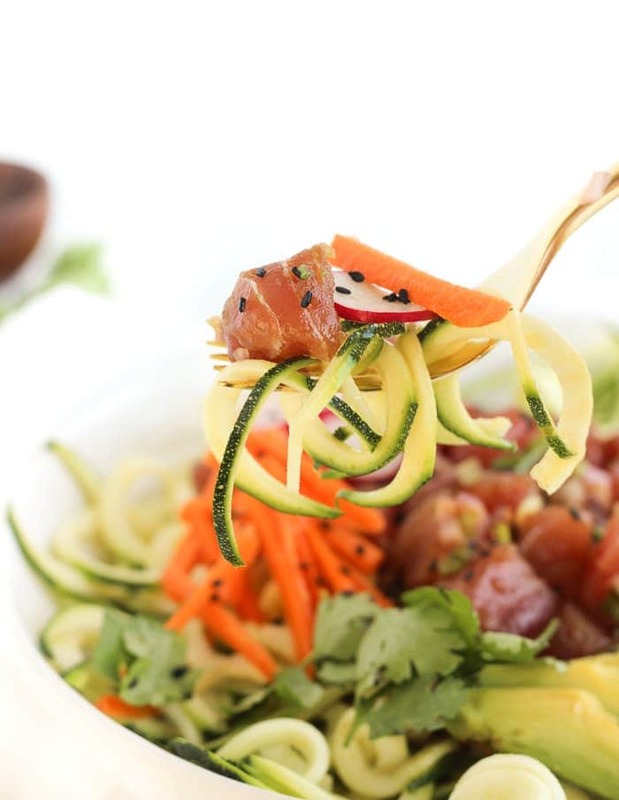 Scoop tuna on top of zoodles and garnish with carrots, radishes and avocado. Sprinkle with cilantro and sesame seeds and serve. **I use Chosen Foods Spicy Sesame Oil. Use code LIVELYTABLE20 for 20% off! I love this for a refreshing but well rounded snack! It still looks complete even without rice!